Feel the freedom of bohemian style. Unconventional and artistic, Boho Boutique's uninhibited designs reflect a fresh take on today's trends. Experience fashion with a free spirit with the Boho Boutique Gypsy Rose 3 Piece Reversible Comforter set. 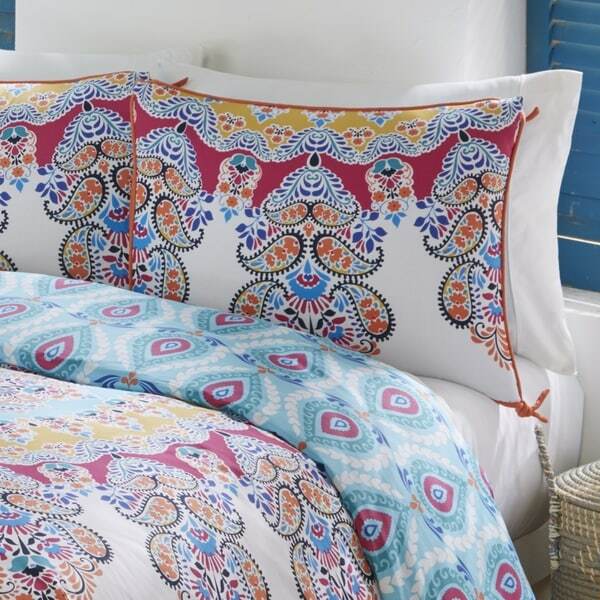 Bright colors and bold, exciting patterns come to life in this globally inspired bedding ensemble. The artisanal style is offered in whimsical color combinations of pinks, blues, oranges, greens and yellow featuring a large-scale statement medallion. Truly two beds in one, the comforter and shams reverse to feature a modern, intricate trellis in aqua, white, and magenta. Orange piping adds the finishing touch to comforter, and a playful styling detail of corner ties on the shams. Set includes one reversible comforter and reversible coordinating shams. Full/Queen measures 90x94 with two coordinating 20x26 shams, and King measures 108x94 with two coordinating 20x36 shams. Decorative pillows sold separately. Machine wash, gentle cycle. Tumble dry low heat. 100% Cotton. Imported.